Ögländ System AB completed their deliveries to Norsborgsdepån in 2017, which is a train depot found partially underground in south-west of Stockholm. This large-scale project was supplied with around 20,000 meters of Mekano® triangular channels and 6000 meters of cable ladders. The brand-new train depot holds space for parking trains, five repair spots, washbay, service and staff rooms. Seventeen parking spaces for trains are located at the end of a 320-meter-long concrete tunnel under Eriksbergsåsen. While the repair and office spaces are located in a facility above ground. 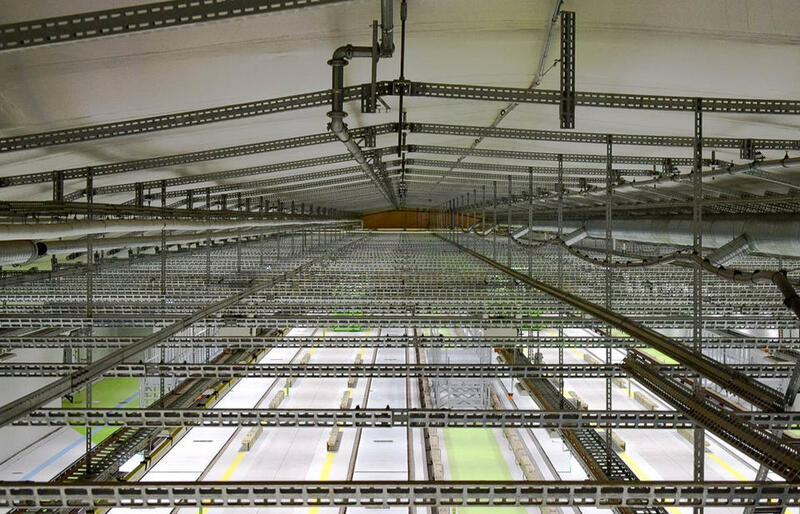 For the entry tunnel Ögländ System AB has delivered a custom-made framework of hot dip galvanized Mekano® channels. This system facilitates all disciplines and was installed directly onto the rock bolts of these underground tunnels. "Our rock bolts could not hold the tolerances they were supposed to and weren't straight, so we got a fixing from Oglaend System that made it all straight, and then we could use a traditional central support system," Peder Oreskär from NCC explains. "We chose Oglaend System primarily because it is a flexible system that is easy to modify or supplement later on. We had strict demands regarding tolerances and load capacity when we installed the system and that will be beneficial in the future," Fredrik Landstorp, SL project manager says. Several challenges such as; tall ceiling, uneven surface and a humid environment had to be considered when choosing the right support system for this project. Due to these challenges it was important that Oglaend System could facilitate for unforeseen modifications. "When we had to make some modifications, we did not have to get a smith to weld and do the reconstruction work. We also got help with picking the right products that suited our project," Peder Oreskär from NCC says. The new depot was constructed as a part of the upgrade works on The Red line to provide improved capacity. There are about half a million travellers on this train line every day. A new depot and new trains will ensure more frequent departures and better comfort for the travellers. The construction of Norsborgsdepån is finished and the depot will be put into operation gradually throughout 2018.